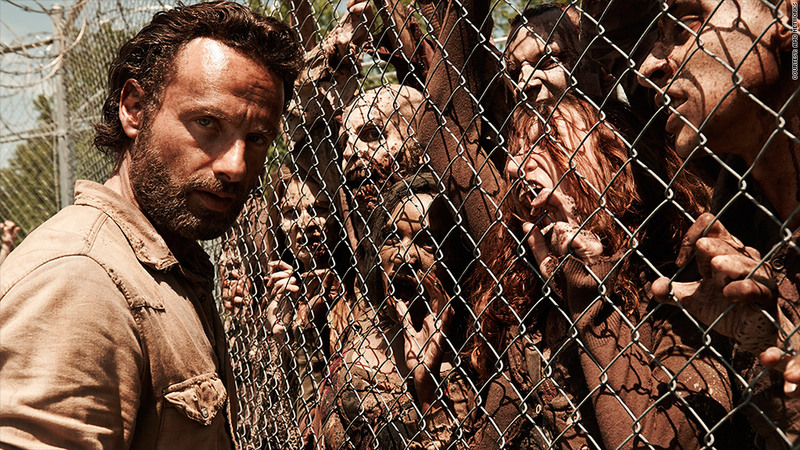 AMC chief executive: "Zombies are thriving"
For AMC, life after death starts with "The Walking Dead." "Breaking Bad" is over. "Mad Men" will conclude next year. Yet AMC can weather the transition because it has the "Dead," one of the most popular shows on all of television.
" 'The Walking Dead' represents not just the biggest show for us, but the biggest show on TV," AMC Networks CEO Josh Sapan said at the Goldman Sachs Communacopia Conference on Thursday. "Zombies are thriving, showing no signs of atrophy." The most recent season's finale attracted a staggering 15.7 million viewers, a finale record high and just shy of the series' overall peak of 16.1 million. While a few network series like "NCIS" have outperformed the "Dead," no other dramas on cable have. This point isn't lost on Sapan, who compared its performance to the huge numbers that sports telecasts pull in, calling it "the NFL" for AMC. Unlike most high-rated sports programming, however, the scripted zombie series can be re-watched, re-sold (to places like Netflix, AMC's strongest relationship according to Sapan), and expanded in new directions. The show debuted on Halloween in 2010 and instantly became the biggest scripted series in cable history among 18- to 49-year-olds. It's kept up most of that momentum since then. So the channel recently green-lit a companion series that will take place in the same apocalyptic world, but set in a different part of that world with a "new cast of characters," according to the press release. The pilot episode will be produced later this year. "We're very very intrigued," Sapan said, about "what we can do with expanding that world." That said, AMC is not putting all its eggs in one zombie-filled basket. Sapan went on to tell investors how other, smaller AMC shows like "Turn" and "Halt and Catch Fire" can grow over time, potentially helping the channel much like "Mad Men" and "Breaking Bad" did before. He also noted that AMC developed "Better Call Saul," a "Breaking Bad" spin-off that will premiere next February. Sapan acknowledged the economic investment that it takes to create quality original content, but said the investment is ultimately "good for the health of the body." He said he wished that AMC had owned the now-departing "Mad Men" rather than production company Lionsgate. "It's very nice that we're the owner of 'The Walking Dead,' " he said with a smile.